Port Orleans Riverside is a popular moderate resort at Walt Disney World. 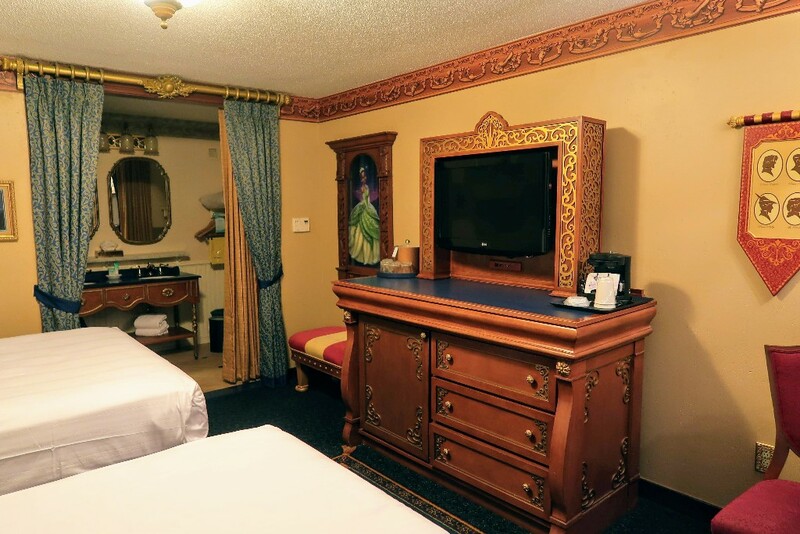 One of the most popular rooms at Riverside is the Royal Guest Room with decor representing Disney princesses. 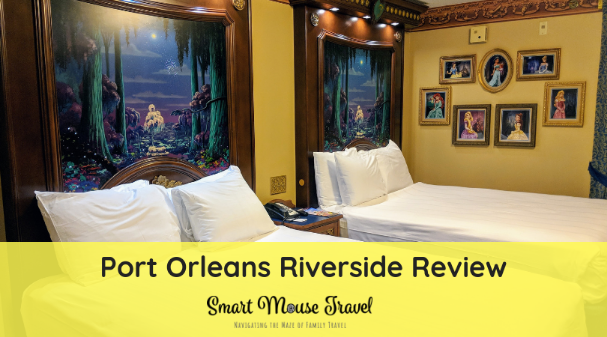 Find out more about the sprawling estate that is Port Orleans Riverside and what special details you should expect in a Royal Guest Room. Port Orleans Riverside is considered a Disney Springs area resort. 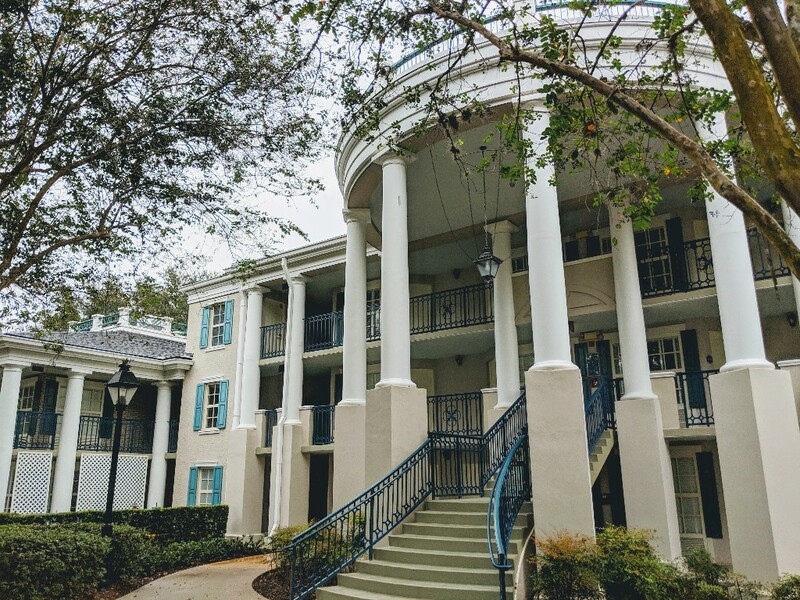 The relaxed and casual vibe of Port Orleans Riverside is felt throughout the large property. The Sassagoula River divides Port Orleans Riverside into various segmented areas. Each of these areas is linked with picturesque bridges and winding walkways. Port Orleans Riverside has a completely different feel compared to the compact and Mardi Gras inspired Port Orleans French Quarter. 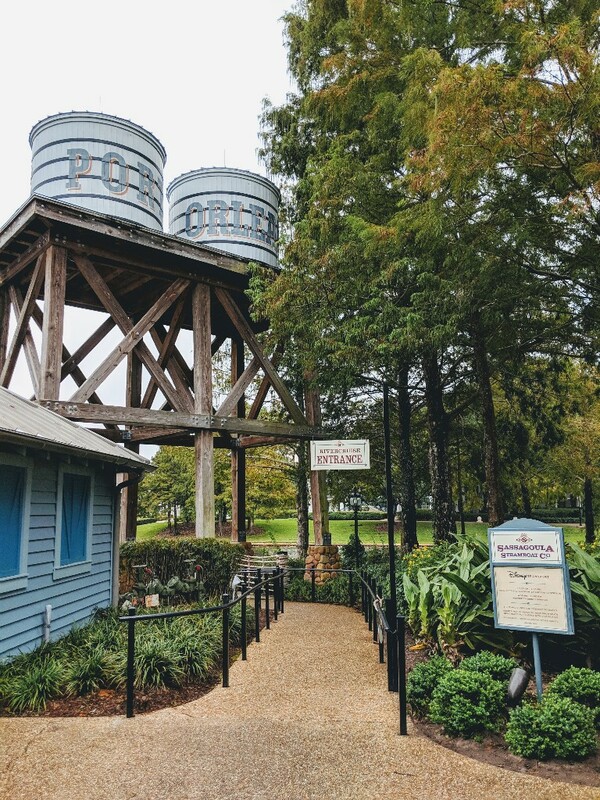 When you first arrive at Riverside the Sassagoula Steamboat Company building will welcome you. Sassagoula Steamboat Company is the name given to the main building at Port Orleans Riverside. This entrance into the resort at Port Orleans Riverside is impressive and acts as a hub of the amenities. The lobby, gift shop, food options, and bike rentals at the resort are all located near Sassagoula Steamboat Company. Although Port Orleans Riverside is a large, sprawling resort I felt like it was set up in a way that the size did not feel overwhelming. In fact, we really enjoyed walking around and enjoying the ambiance of the resort. Port Orleans Riverside has many small buildings that house the various hotel rooms. The resort rooms are divided into two large sections: Alligator Bayou and Magnolia Bend. Alligator Bayou has smaller, rustic looking buildings while Magnolia Bend buildings look like large plantation mansions. There is no shortage of pools at Port Orleans Riverside. No matter which hotel room you are in there is a pool nearby. There are 5 leisure pools at Port Orleans Riverside sprinkled around the property. There is also a main pool with the waterslide and bar. This pool with additional amenities is located at Ol’ Man Island. Ol’ Man Island truly is an island in the Sassagoula River. There are three bridges that connect Ol’ Man Island to various points at Port Orleans Riverside. One of the most unexpectedly fun things we did at Port Orleans Riverside was rent bicycles at the Riverside Levee Marina. You can rent traditional bikes or surrey bikes that hold 2 or 4 people. Since Elizabeth was too short to reach the pedals on the surrey bikes we opted for traditional bicycles. There were several sizes of bikes to choose from which was a nice surprise. A helmet was provided for Elizabeth at no additional charge. 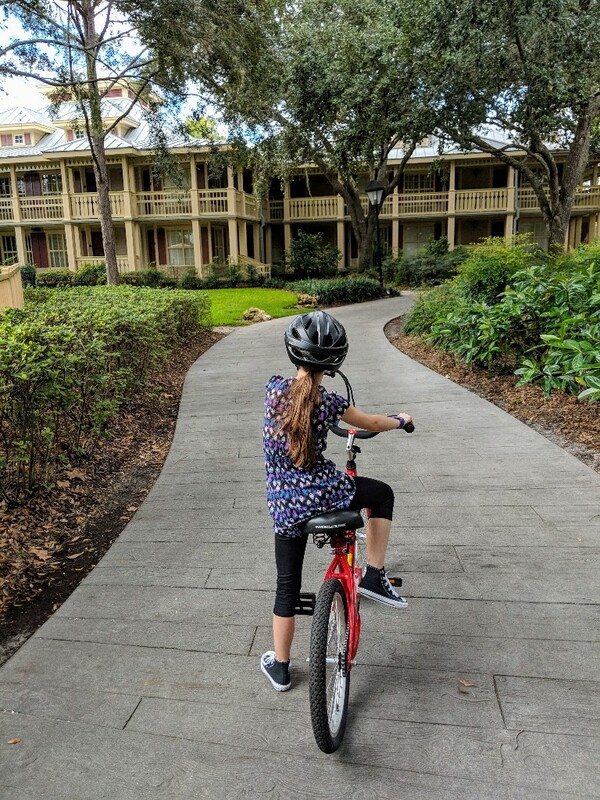 We rode around the entire Port Orleans Riverside and Port Orleans French Quarter properties on our bike ride. The bike rentals are a great way to get an overview of the Port Orleans resort grounds. There is a playground at Port Orleans Riverside and can be found on Ol’ Man Island. This casual table service restaurant at Port Orleans Riverside has a menu highlighting many southern favorites with a strong leaning toward seafood items. 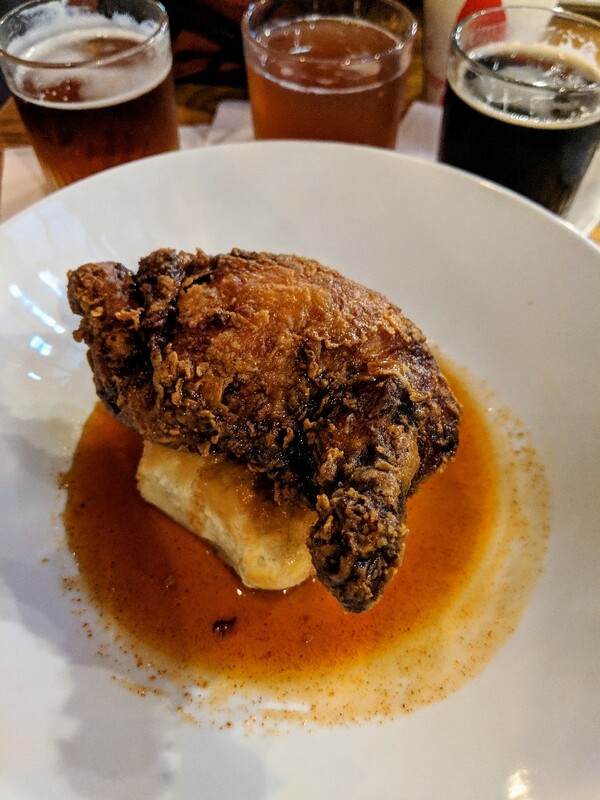 My Nashville hot chicken was good, but not particularly spicy. Elizabeth’s steak skewers were bland and tough which was disappointing. Maybe we chose the wrong items at Boatwright’s Dining Hall, but we both agree that Sassagoula Floatworks and Food Factory at Port Orleans French Quarter was a better meal. Muddy Rivers has several bayou inspired cocktails and non-alcoholic drinks for you to sip poolside on Ol’ Man Island. River Roost lounge has live music and drinks to help you unwind after a day at the parks. Riverside Mill Food Court is the main quick service option at Port Orleans Riverside. This spot serves breakfast, lunch, and dinner daily. The menu has many traditional quick service items like pizza and burgers in addition to other healthier items like sandwiches and salads. The Royal Guest Room at Port Orleans Riverside is so much fun for the princess fan in your family. 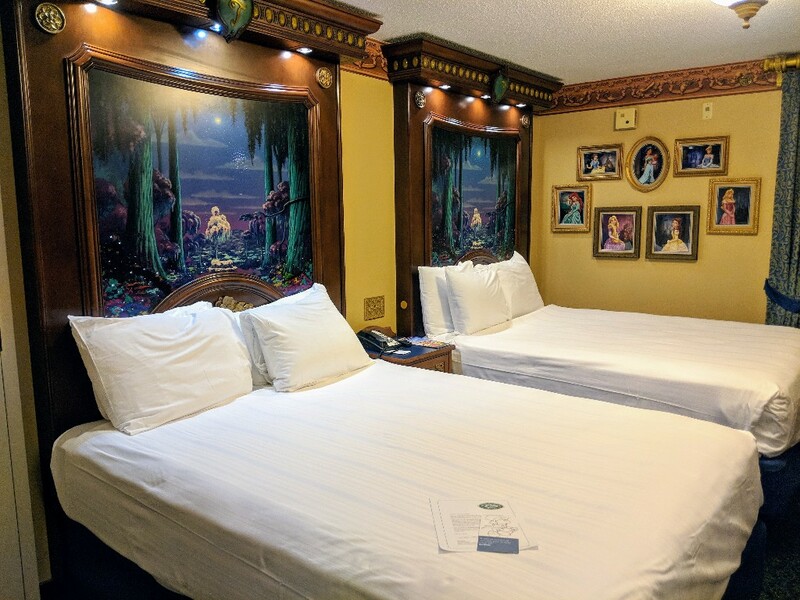 The room layout is nearly identical to our Garden View room at Port Orleans French Quarter, but with so many amazing Disney princess details. 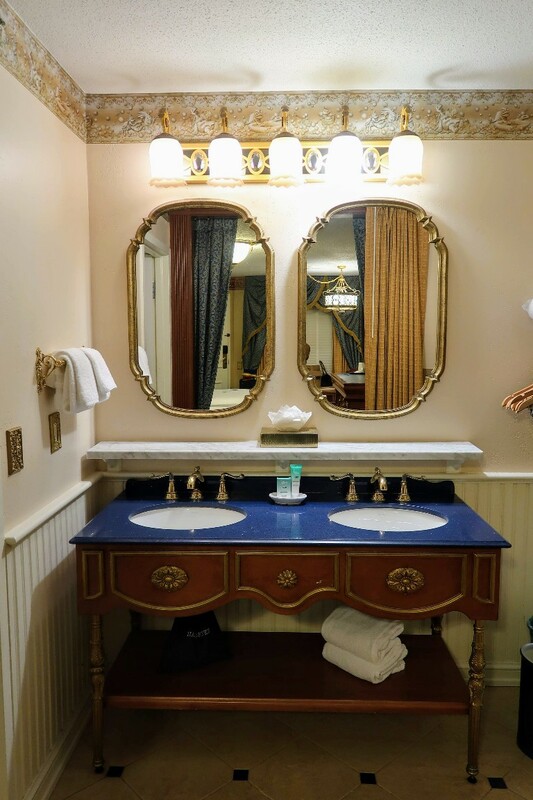 What Makes The Port Orleans Riverside Royal Guest Room Special? When you enter a Royal Guest Room there are many princess details competing for your attention. Elizabeth first noticed what looked like a letter on the table just inside the doorway. She immediately started reading the welcome letter from Tiana aloud. 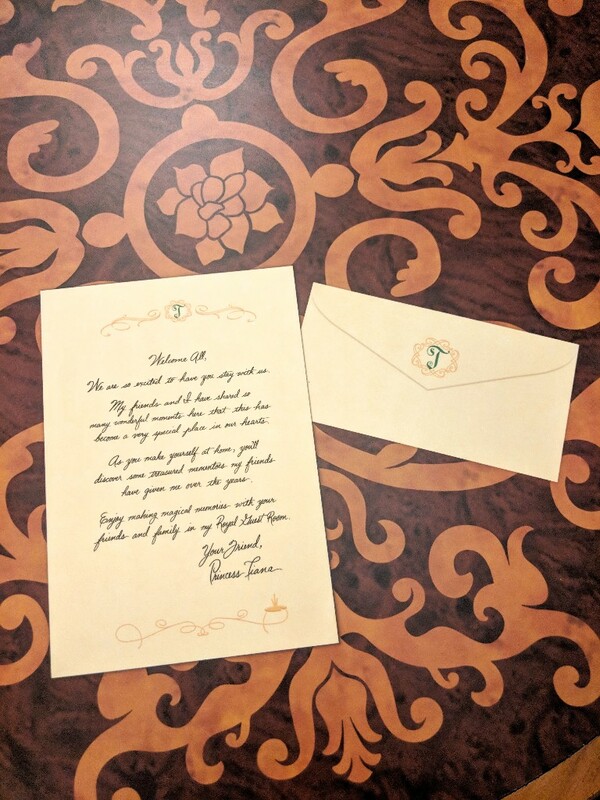 In the letter, Tiana says that she has had many great moments with her princess friends here and that this room is very special to her. Tiana also writes that you should look around the Royal Guest Room for mementos that her princess friends have given to her. This letter started our hidden princess memento hunt around the room. Spoiler Alert: Please skip this section if you want to find the mementos on your own. 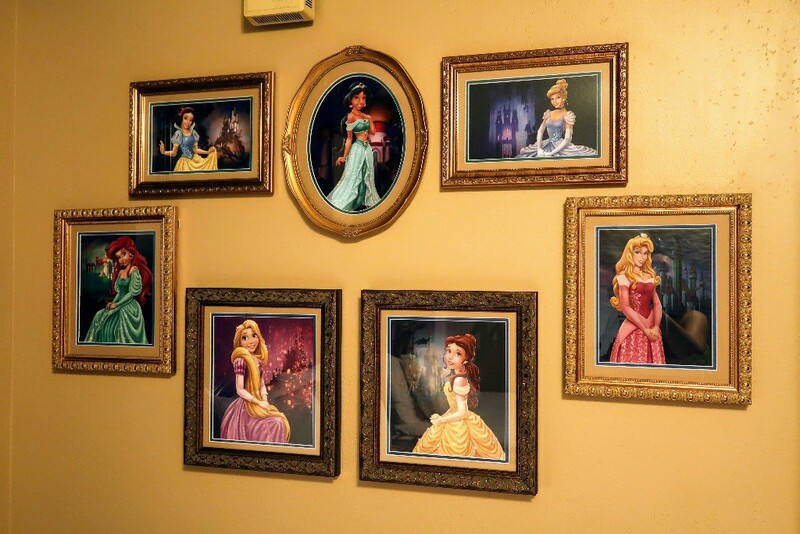 There are portraits of seven Disney princesses hanging together on a wall of a Royal Guest Suite: Snow White, Jasmine, Ariel, Rapunzel, Belle, Cinderella, and Aurora. There is also a large portrait of Tiana in the room. This gave us an idea of what sort of items we might find in the room. The easiest items to spot were those related to Jasmine. The faucets are shaped like Genie’s lamp and a magic carpet is on the floor in front of the dresser. Next Elizabeth found the seat next to the dresser looked an awful lot like Sultan, the dog turned footstool from Beauty and the Beast. 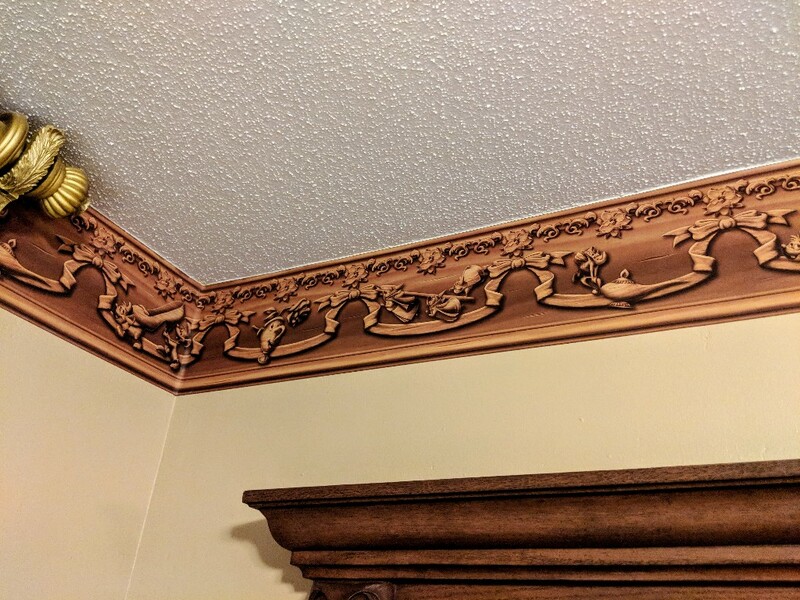 The border along the ceiling in the bedroom area also includes images of Chip. 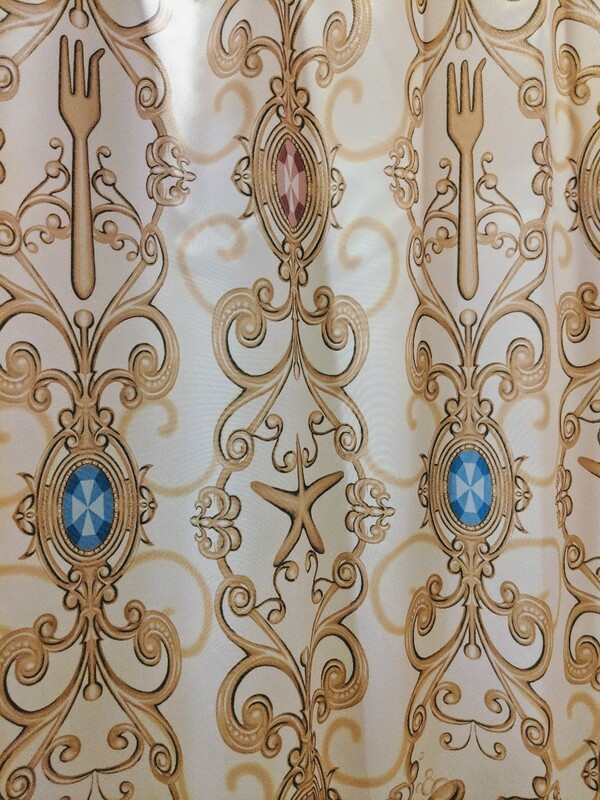 Another obvious princess memento was the shower curtain which featured Ariel’s dinglehopper, sea stars, and snarfblat. Scuttle and Sebastian are also found in the bathroom border. After this it gets a little trickier. Cinderella is represented by a carriage coat hook which Elizabeth spotted and I never even noticed. 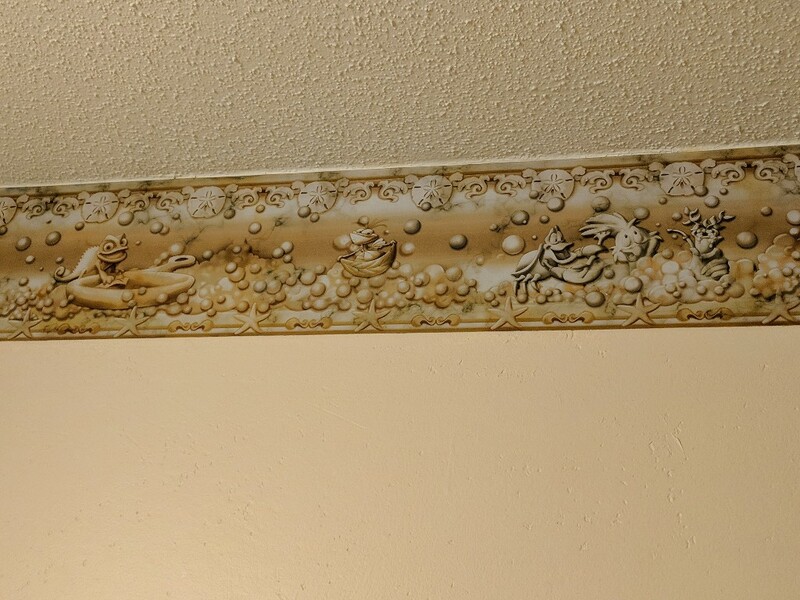 Some mice friends and Cinderella’s slipper are in the bedroom wallpaper border, too. Rapunzel’s mementos are Pascal and her cast iron skillet found in the bathroom border. Snow White is represented by the intricately carved wooden frame that holds Tiana’s portrait. Last, but not least Sleeping Beauty’s three fairies Flora, Fauna, and Merryweather are all represented in the bedroom border wallpaper. The bedroom area has two queen beds, a dresser with mini fridge, and a table with two chairs. Our Royal Guest Room had a connecting door to an adjoining room. I was concerned that we would hear noise from the next room, but either the group next door was extremely quiet or the doors are thick enough to dampen noise between the rooms. The table has the sweet welcome note from Tiana, but that isn’t all that is special in the bedroom area. There is a small button on the side of each of the headboards. When you push the button the headboard lights up and has “fireworks” over the bayou scene. I’m not sure who enjoyed the light-up headboard more, Elizabeth or me! The dresser has drawers for our items on one side and the mini fridge on the other. There is also a small single or double cup coffee maker in the room with basic supplies. The bathroom and bedroom area is separated by a wide doorway. This doorway has a long blackout curtain that can be pulled across to provide privacy between the sink area and the beds. This blackout curtain was particularly helpful when I would get ready in the morning while Elizabeth was still sleeping. I could turn on the bathroom lights and very little light would enter the bedroom area. 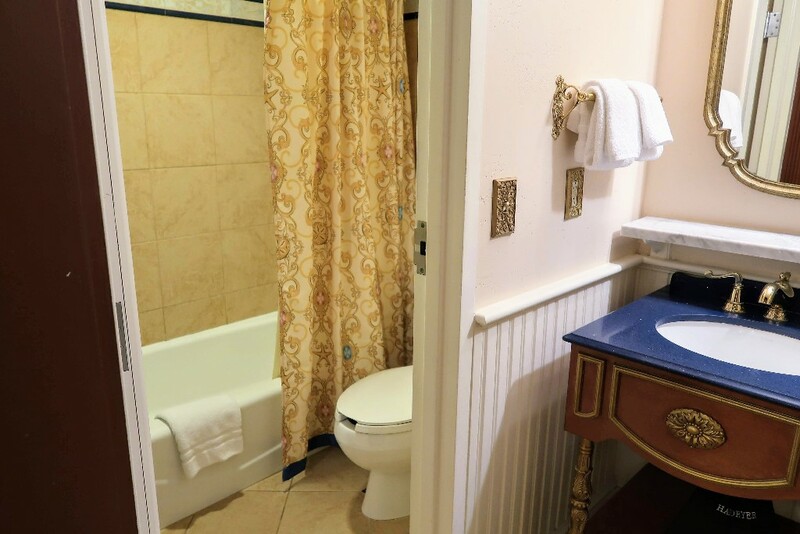 A Royal Guest Room bathroom has two sinks with a storage shelf underneath. The shower, tub, and toilet are in a separate room than the sink area. I love split bathrooms because they make it easier for multiple people to get ready at once. There is no closet in the Port Orleans Riverside Royal Guest Room, but there is a long bar next to the sinks to hang clothing. There is also a large shelf above the hanging rack where you can store additional items. 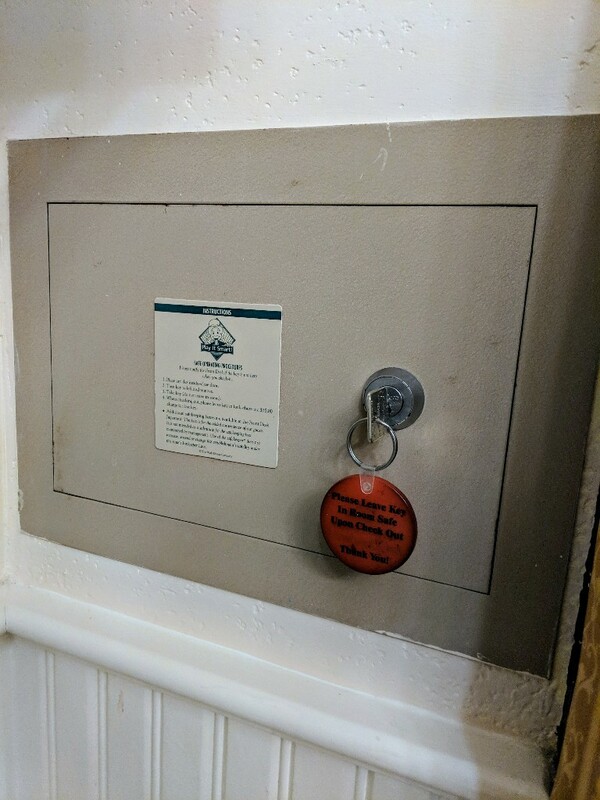 The biggest disappointment in our Port Orleans Riverside Royal Guest Room was the in-room safe. The safe was not a programmable electric one like we have come to expect, but was locked with an actual key. I didn’t love having to worry about taking a key with me for a day exploring Disney World. Free WiFi is available for Disney’s Port Orleans Riverside Resort guests at no charge. Disney’s free WiFi works well for checking email or social media accounts, but not for things like streaming video. Registered guests of Port Orleans Riverside Resort pay $19 per night for self-parking. The Disney World bus system provides direct transportation from Port Orleans Riverside to Magic Kingdom, Hollywood Studios, Animal Kingdom, and Epcot. To reach the water parks you first take a bus to either Disney Springs or Animal Kingdom depending on the water park. Then you transfer buses to access your desired water park. Since Port Orleans Riverside is a larger resort there are actually 4 bus stops on property. One is found at the main Sassagoula Steamboat Company area and the 3 others are set along the outside edge of the resort. At first the number of bus stops worried me, but I found it was convenient to have a stop close to our room. Want to learn more about transportation at Disney World? Check out my complete guide. Just behind Sassagoula Steamboat Company is the Riverside Levee Marina. This is where boats from Port Orleans Riverside make their round trip to and from Disney Springs. Find out more about this form of transportation in my Port Orleans French Quarter review. There is a beautiful walking path along the Sassagoula River that links Port Orleans Riverside to French Quarter. If you prefer not to walk, some of the boats at Riverside Levee Marina will shuttle guests from one resort to the other. 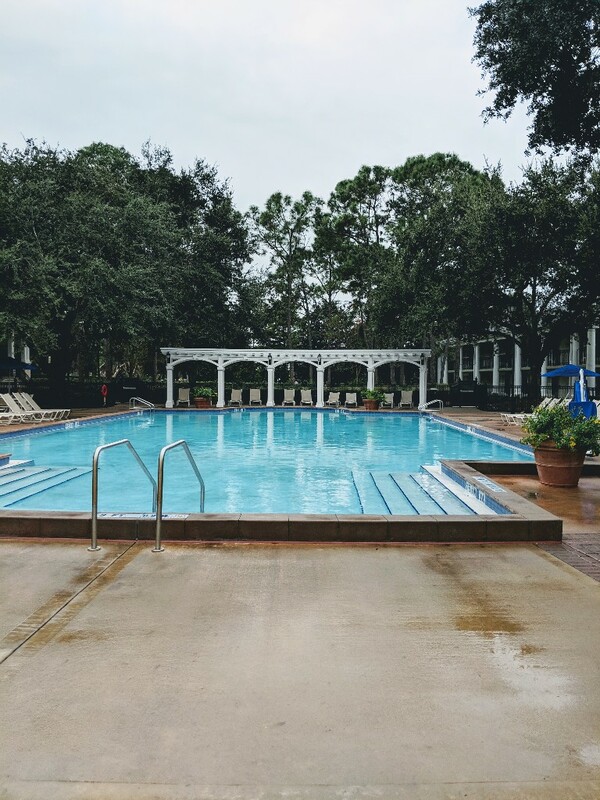 The lush grounds of Port Orleans Riverside plus the stately manors of Magnolia Bend or rustic charm of Alligator Bayou made us want to linger and enjoy the resort. Our Royal Guest Room was a highlight of the resort and finding the special details throughout the room made for an enjoyable time. Although the Royal Guest Room was not as recently updated as our room at French Quarter (as evidenced by the safe with a key), the unique decor of the room was a hit with Elizabeth. After our stay I asked Elizabeth which Port Orleans property she liked best. 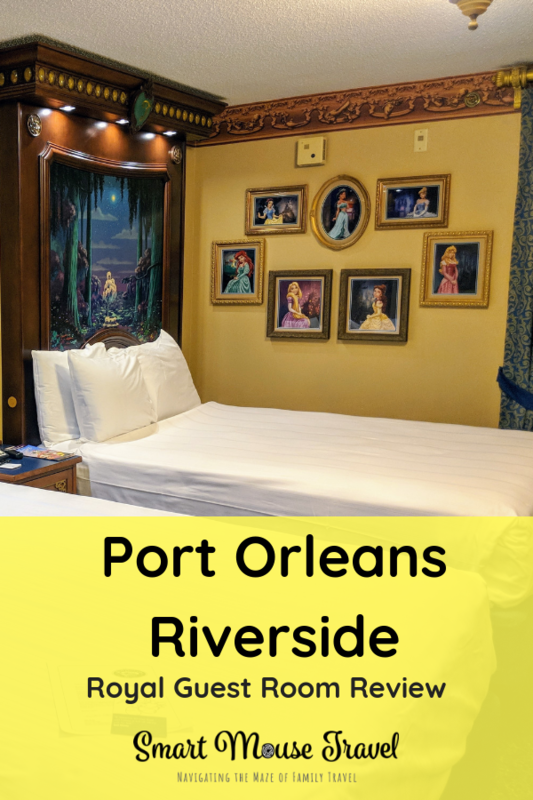 Her response was she liked the Port Orleans Royal Guest Room better, but liked the compact town like feel of Port Orleans French Quarter more than Riverside. 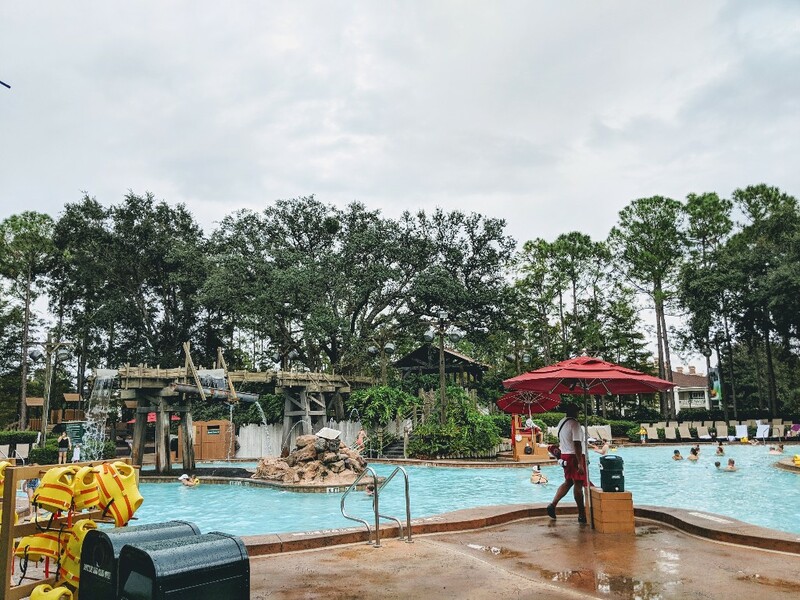 If you are deciding between to the 2 Port Orleans resorts make sure to read my full French Quarter review to help you decide which is right for you. Each resort has a very different feel. I think the best part about Port Orleans is that no matter which one you choose for your stay the other is just a short walk away. This allows you to experience the best of both Port Orleans resorts. Need more help planning a Disney World trip? Check out even more planning articles here. Did Riverside also have loud toilets? We did not notice loud flushing at Riverside. Hope this helps. Loud flushing toilets were a problem for us at Little Mermaid room at Art of Animation.